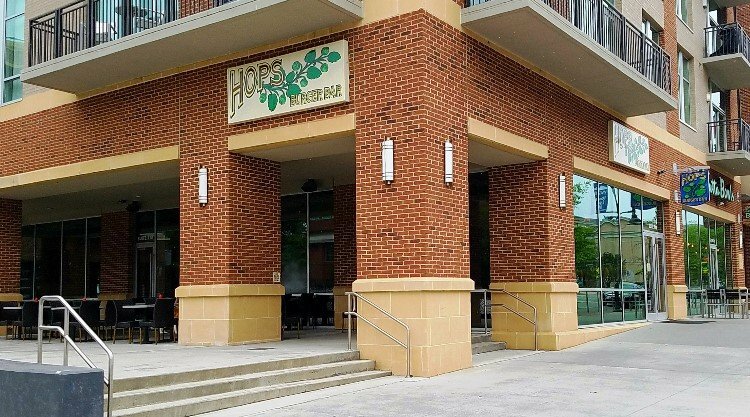 Hops Burger Bar, Chapel Hill - Raising the Burger Bar on Franklin Street! Let’s face it, I’ve never met a burger that I didn’t like! I mean, it’s hard to mess up the classic hamburger and I’ll eat ALL of them. But that’s why it’s so hard to be a really great burger joint, to come up with a burger concept that stands out. And that’s also why I’m pretty impressed with the new Hops Burger Bar out in Chapel Hill. The small chain of burger restaurants from Greensboro opened up right down the street from the ever popular Al’s Burger Shack. Would they be able to compete? After a couple of visits, I can say with some certainty, yes! I first ran into Hops Burger Bar on a random visit to Chapel Hill and had plans to go to another spot for lunch but walking by, it looked interesting! 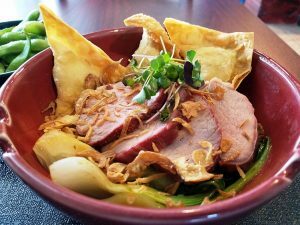 They don’t have a large social media footprint so their quiet opening had slipped under my foodie radar screen! 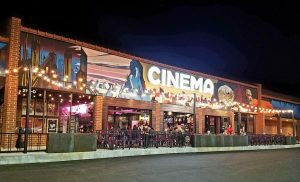 Located in a premium corner spot on Franklin Street and Church, Hops Burger Bar has a covered patio and wrap-around plate glass windows. Inside, Hops Burger Bar is fronted by a nice bar showing off some beer taps and bottles. 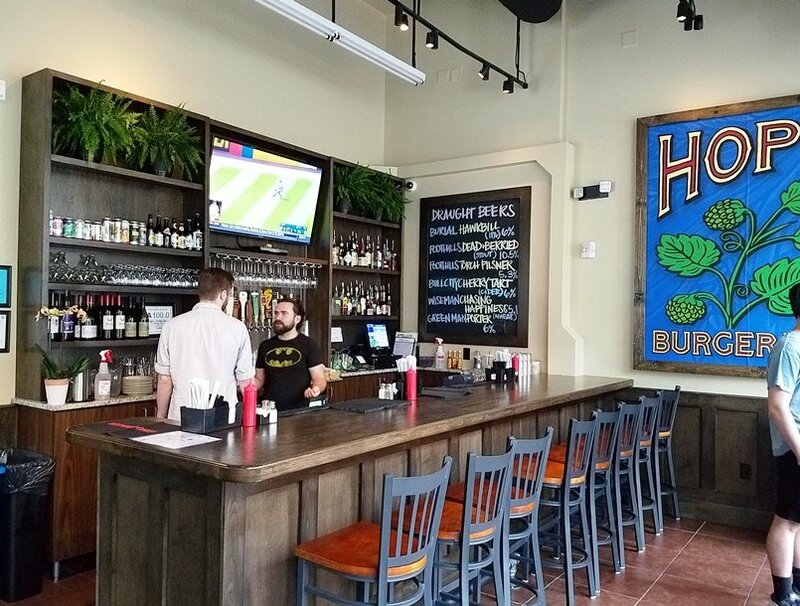 The dining space at Hops Burger Bar is large and open with high ceilings and a very casual feel. Grab a seat, grab a menu and let’s figure out what to eat! Hops Burger Bar offers up 10 house specialty burgers in addition to Build Your Own. With toppings such as hibachi white sauce, pepper jelly, mango-jalapeno salsa along with 10+ cheeses, you can bling out your burger to your heart’s content! You also get to choose from a kaiser roll, brioche bun, marble rye and more for your bread. Burgers are sized at 6 oz, 8 oz and 12 oz so they are ALL PRETTY big! 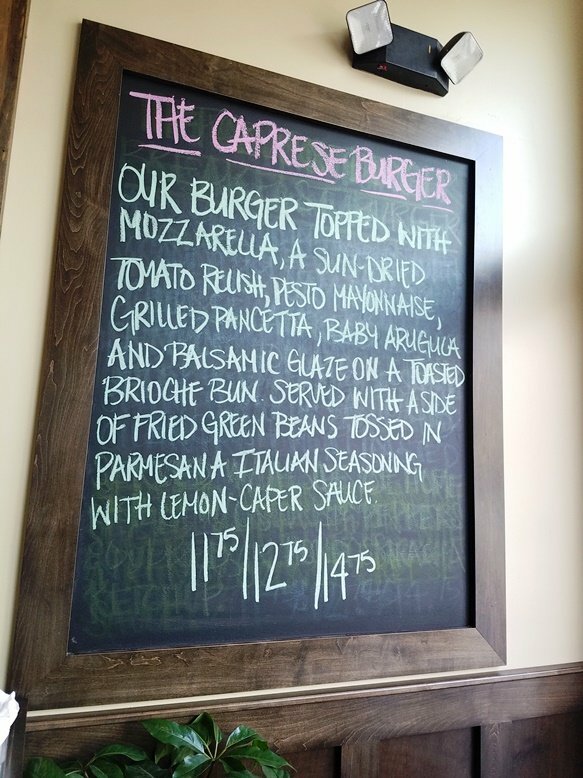 And Hops Burger typically has a specialty burger of the week, check out the chalkboard menu or their Facebook page for details. But as you can tell, you’re not getting a boring old burger here at Hops Burger Bar! 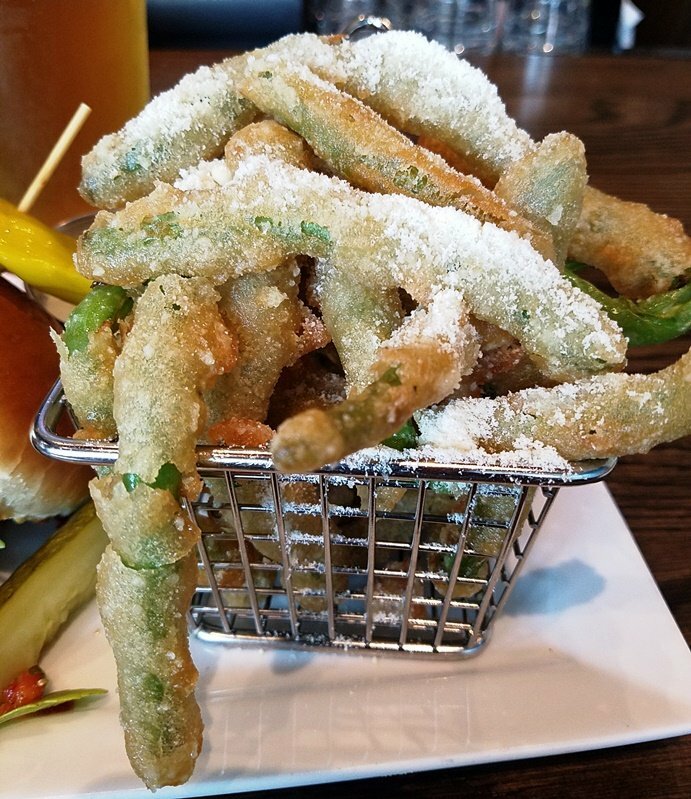 Sides run the gamut from your standard fries, chips to sweet potato fries, carrot-zucchini chips and onion rings for an upcharge. 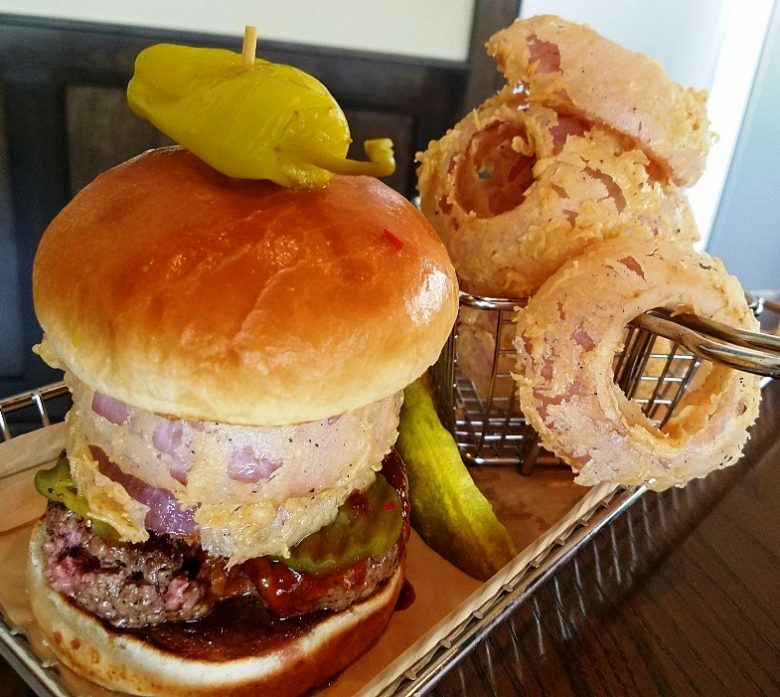 If you come in for a meal, you definitely don’t want to miss their Pickleback burger which comes stacked with two large, fried onion rings, spicy barbeque sauce and bourbon-soaked pickles! The beef is cooked nicely medium for me and yes, the burger is a bit of a saucy mess but certainly delicious. Hops Burger Bar uses some quality ingredients including a nicely toasted brioche bun with a bit of sweet. I also like the fact that their onion rings are made with the tastier red onion versus the standard white or yellow onions. A pickle on the side and pepper pinned to the burger, finishes up my lunch. Visit #2 to Hops Burger Bar allows me to explore their specials. Every week you’ll find an update on their Facebook page and I’ve seen some very tasty looking combos. 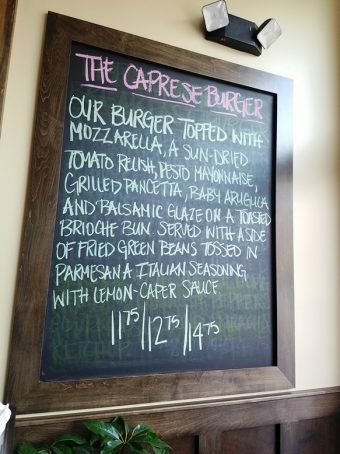 For my visit, I get to try out their Caprese burger which is topped with mozzarella, arugula, tomato relish, pancetta and balsamic vinegar! A very gourmet type burger but fantastic. Hops Burger Bar does a nice job constructing their sandwiches but when they get this big, ain’t nothing but a mess is going on. 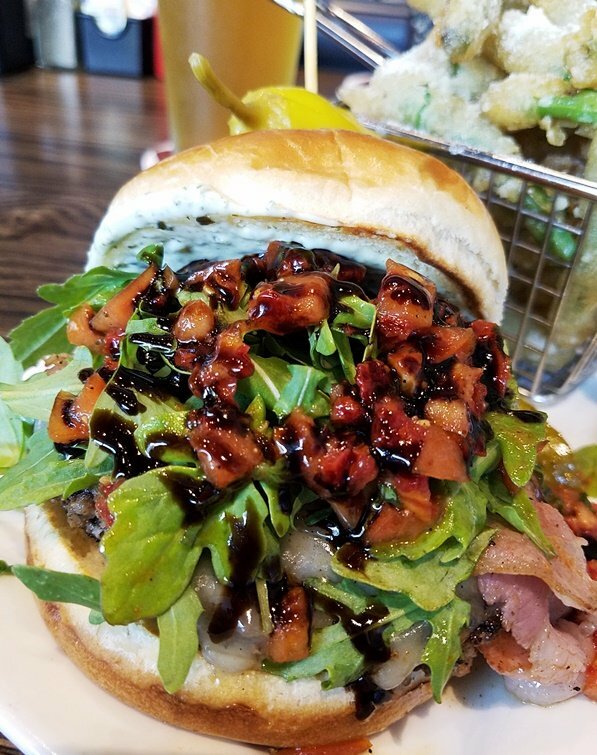 As long as most of that burger makes it into your mouth, it’s all good because you don’t want to waste this deliciousness!